9th June, Riyadh: UAE's Hussain Al-Suwaidi of UAE captured his first international title as outclassed challenger, Fadhel Al-Mousawi of Kuwait, 205-139 in the finals of inaugural the ABF Tour Saudi leg at Universal Bowlng Centre on Saturday afternoon. Hussain Al-Suwadi from Dubai, UAE posted the second highest score of the tour when he eliminated fellow compatriot, Sayed Ibrahim, 235-200 in Round 1. The 27-year-old went on to beat Yousif Al-Jaber of Qatar, 212-192 to reach the semifinals. Fadhel Al-Mousawi, on the other hand, easily beat top-seed, Abdulla Al-Qattan of Qatar, 220-198 in Round 1. He had to fight harder to earn his spot in the semifinals when he ousted another Qatari, Saeed Al-Hajri, 231-223 in the second round. In the deciding match between Hussain and Fadhel, there was nothing seperated the two when both knocked down 9 pins and spared in the first two frames. When Fadhel had two splits in frames three and fourth, Hussain gained a little confidence to spare and strike in his next two frames to lead with 28 pins. 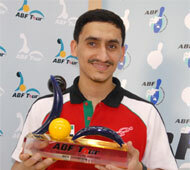 Despite a strike in the fifth frame, Fadhel suffered another split in the sixth which more or less, decided the match. Hussain rounded off a double to end the match with 205 while Fadhel posted the lowest game of the leg. "I know I had made the finals with 3 good games but I didn't expect to have an easy match especially against a good bowler like Fadhel," said the 27-year-old champion. "This is a good present for me when I celebrate by 28th birthday next week in Manila. "The ball I used in the first three matches was good but when the oil got carried down, I just didn't have anymore suitable ball to handle the lane condition," said the slightly disappointed Fadhel. "That's bowling and I'll look forward to another leg to try and win a title this year. The inaugural Saudi leg was telecast LIVE on Saudi Sports Channel and highlights of the leg will be televised later on local television stations of the eight countries where the tour is being held. For further information and details please contact ABF Tour Committee Marketing and Event Management Division at Tel: +852 2810 5191; Fax: +852 2810 5192; Mr. Steven Chan (Mobile: +852 9303 3102; email: steve.chan@tndgroup.com).